Today, President Obama signs the JOBS Act into law, legalizing crowdfunding in startups by non-accredited investors, so that anyone and their mother can invest. The new law stipulates that entrepreneurs can now raise money from any and all, however, startups are limited to $1 million per year, and must stick to portals approved by the Securities and Exchange Commission. What’s more, the legislation dispenses with the 500-shareholder rule, which put a limit on the number of shareholders a company was allowed before registering with the SEC (and going public). The new law gives high-growth companies a longer grace period, or on-ramp, leading up to IPOs, and lifts some of the one-size-fits all regulation that likely has been hampering the IPO market. While this is a big win for startups, it puts significant pressure on the crowdfunding market to self-regulate — which is risky. That’s why 13 equity and debt crowdfunding platforms and insiders have come together to form a leadership group to bring attention to the need — really, requirement — for the industry to develop effective self-regulation, best practices, and investor protection. As the JOBS Act requires all crowdfunding sites to be members of a national securities association, the group is on a mission to find the best way to do that in a way that encourages the new industry while protecting investors. The “leadership group” is to include members of the crowdfunding industry, (duh), who will be working in collaboration with legal, securities, and SEC experts — many of the same people who helped push the JOBS Act forward. According to the its statement, the leadership group will seek to “agree upon a set of principles as well as explore the development of a robust industry regulator.” The group will be collaborating with the SEC during its 9-month rule-making process that will enact the crowdfunding rules. Create a recognizable brand common to trustworthy intermediaries (akin to VeriSign or BBB). In the end, it’s all about implementation, and how effectively these principles can be established and protected on the wild and woolly web that’s seen its fair share of fraud. Plus, a cynic might raise an eyebrow at asking the very platforms that stand to gain financially by an explosion of crowdfunding to police themselves. That being said, this is an important step for the crowdfunding industry to take — as long as it’s not simply for show. The passage of the JOBS Act is a veritable miracle, in the sense both parties’ political interests actually aligned. It seemed for once it behooved them to dispense with the typical partisan tomfoolery, and send a message to their constituencies (in an election year, by the way) that they are taking the necessary steps to create jobs. By starting work right away on regulation that protects investors and enables a strong crowdfunding market, the group is demonstrating a willingness to work with the SEC for the good of mom and pop investors and to take self-regulation seriously. 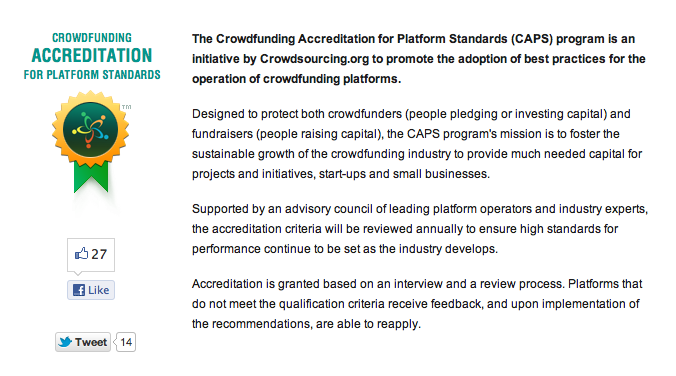 Crowdsourcing.org, a neutral professional association and industry resource that offers news, articles, videos, and site information on all things crowdsourcing and crowdfunding, has established the Crowdfunding Accreditation for Platform Standards (CAPS) program to create standards for crowdfunding operations, and while the industry creates self-regulatory frameworks, CAPS has been designed to govern the accreditation of crowdfunding platforms. With more than 400 crowdfunding platforms already operating in January 2012, and a new wave of sites likely to launch in the wake of Obama’s approval, the initiative to establish accreditation criteria — in collaboration with the SEC — to ensure crowdfunding platforms adequately protect fundraisers and investors is essential. Council member and founder of Crowdsourcing.org, Carl Esposti, said that more than 200 crowdfunding platforms are expected to apply for accreditation in 2012. There are likely very few entrepreneurs who would disagree, but that deregulation has to be managed very carefully, or the industry will be in for a very bumpy ride. CAPS and a crowdfunding leadership group doesn’t sound like a bad place to start.